This understated holiday decoration combines various holiday symbols to create an overall story. 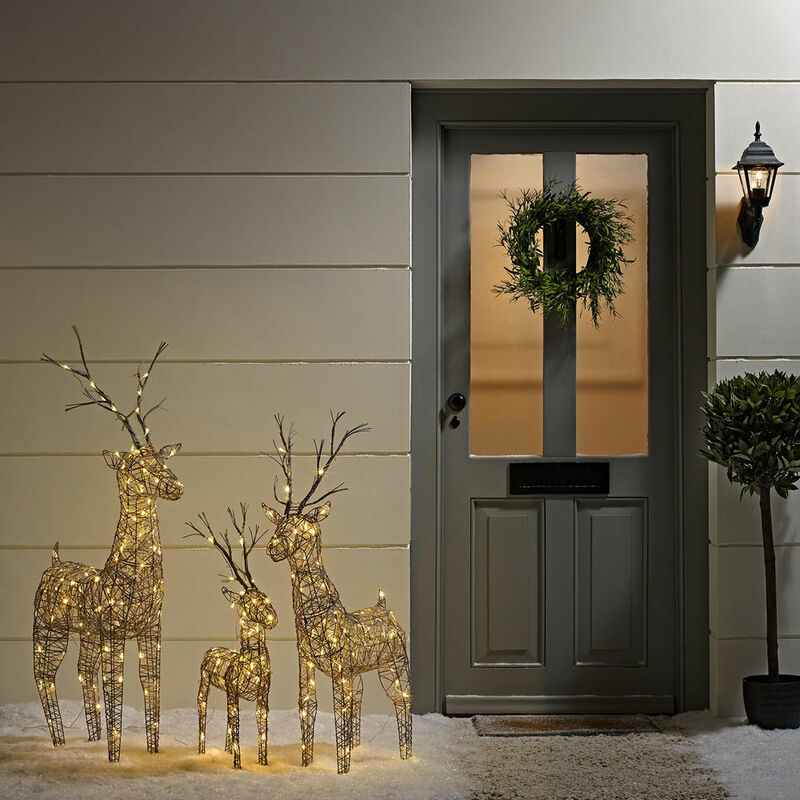 The lighted trio of deer brings a calming atmosphere to this serene entrance. Continuing the minimalist theme of the house, the simple wreath and globe topiary, bring a touch of nature to the scene. Combined with the illuminated deer, these decorating ideas help create the overall look of this serene Christmas holiday scene. 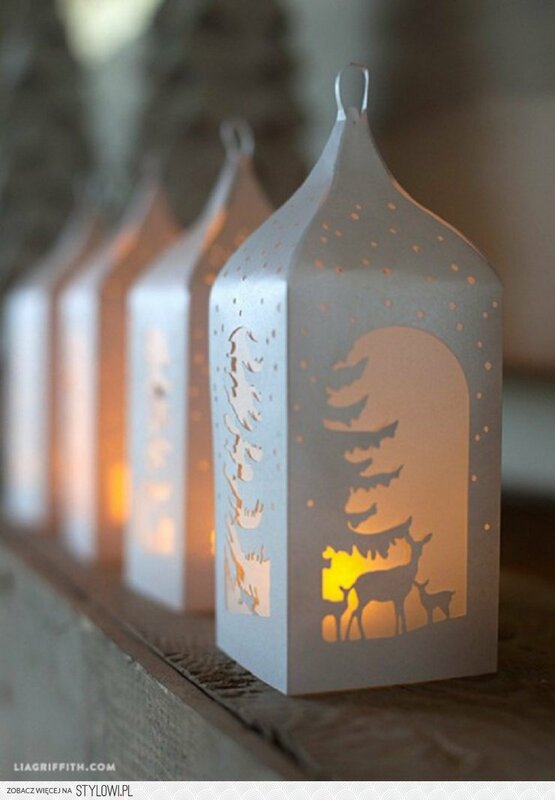 You can substitute the deer with any other grouping or lighted figurines. Similarly, the wreaths can be larger and topiary adorned with lights to promote the illuminated theme of the décor. 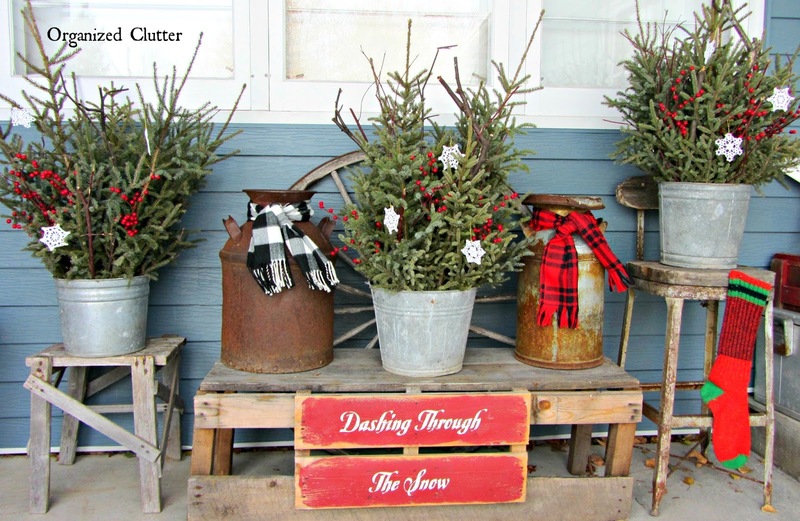 This scene is good for backyards or garage areas that use items found around the yard for holiday inspiration. In this idea tin buckets and pots are placed on various tables and chairs to display collected pine tree shrubs. Jazz up the shrubs with cranberries or plastic ornaments, scattered about the shrubs. Place old scarves around the top of the tin to bring in the element of winter. Tie the whole look together with a painted sign highlighting a personal holiday message. Ask your family to choose the saying. Join the ranks of Henri Matisse and make your own lantern cutouts with a personal holiday theme. Here’s a great Christmas craft project you can get children involved in and prepare during the holiday season. Look for a holiday scene, trace it on old gift boxes, and cut out the image to create the cutout effect. Place vellum or parchment paper to mimic glass and create the lantern effect. Place a battery-operated candle inside the box for illumination and top it all off with a metal clip to resemble a Christmas ornament. Make in multiple sets. Put your high school crafting skills to use by bedazzling your mailbox. Look for holiday cards and gifts in this ‘merry’ Christmas decoration. An added benefit is that it greets your mail carrier daily as he or she delivers your mail. In this simple arrangement, poinsettia flowers, pine combs, baby’s breath, and ribbons are intertwined and placed on green garland to create this decoration. 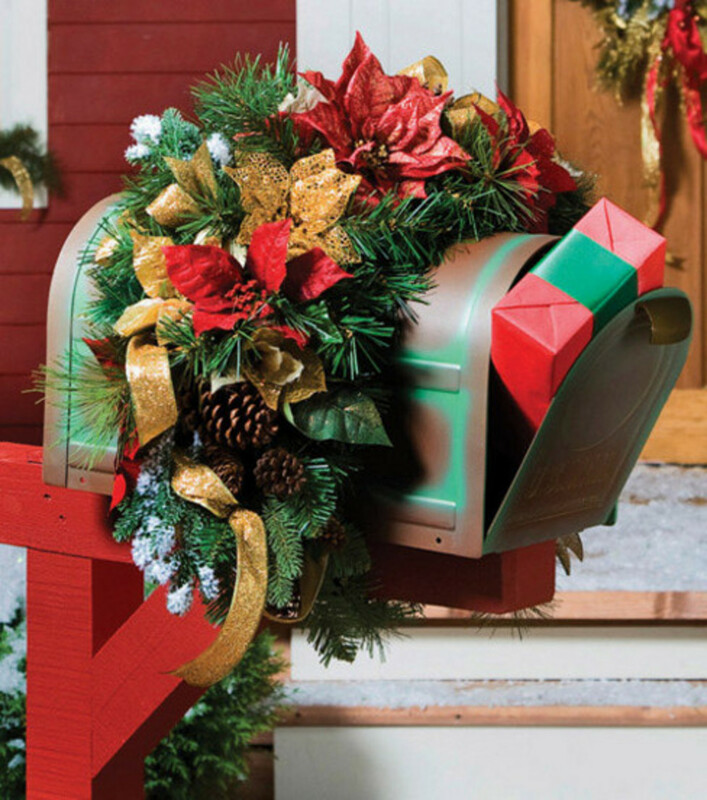 The garland is then placed around the mailbox and secured with wire. Use the same color scheme as the ribbons used in your door wreath to tie these decoration ideas together. Christmas outdoor decorations are best when they tell a story. 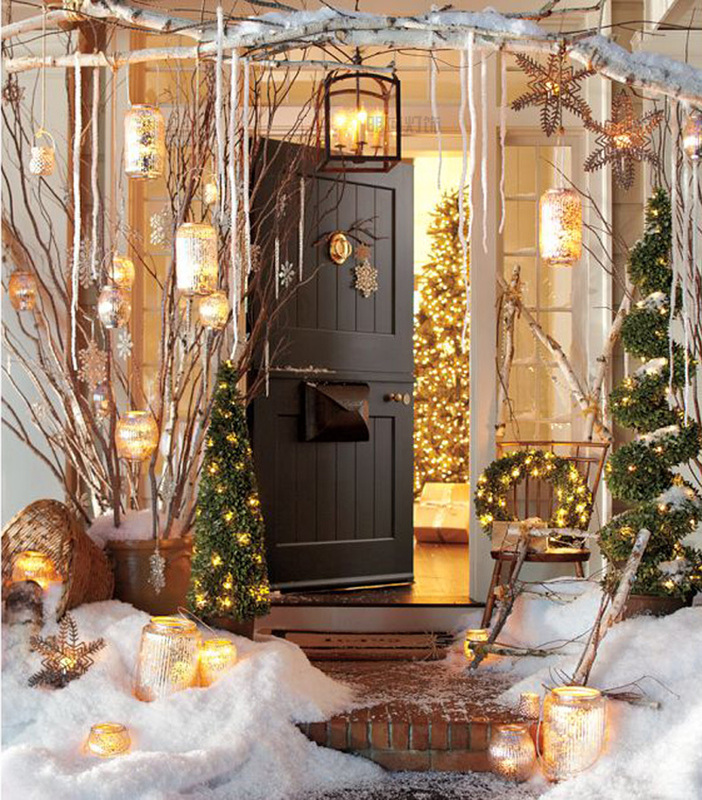 In this winter wonderland scene, traditional symbols of the holiday season are grouped together to create an unforgettable entrance. This intricate project consists of many elements and tying everything together is illumination. You can use fake snow to create the landscape and then add golden lanterns, vases, and containers to hold candles and provide illumination. Place branches and twigs in planters and frame around the entryway for additional spots to hang your lanterns. Adorn plants and wreaths with electric lights sprinkling snow inside the pots like fallen snow. This Christmas craft reminds the viewer of Christmas at grandma’s house. 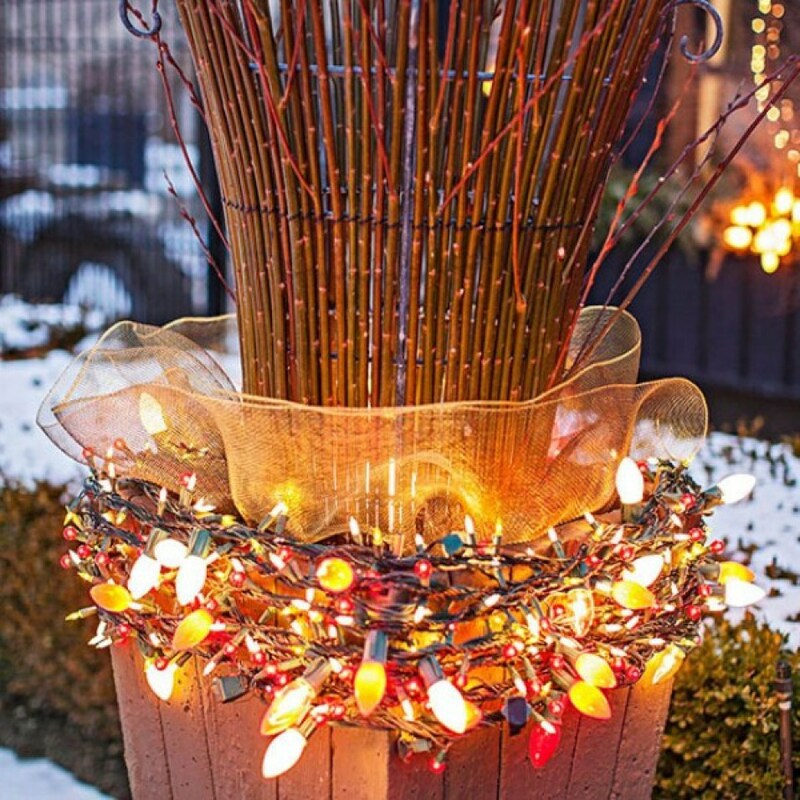 The electric lights, in colorful old-school bulbs, are simply wrapped in multiple layers around a planter found in the yard. The tulle or wide ribbon in holiday gold adds a festive touch to the display. Collect tall bamboo or other branches and arrange in the planter, keeping the branches in place with wire. Decorate one or multiple planters like this and arrange them in a sequence to light your house walkways or entryways. It is also a good way to use old electric Christmas lights. These Christmas outdoor decorations will be the talk of your apartment complex community. Well-suited for a small outdoor space, like a deck or balcony, with outdoor furniture kept outside during the winter. The key here is the color theme. 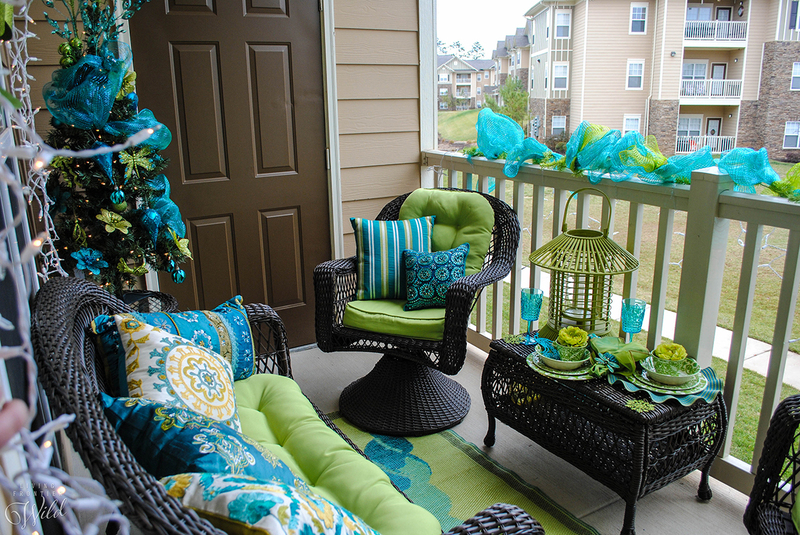 Play-off the colors of your existing outdoor furniture to complement and adorn your small outdoor space. Add a Christmas trees with ribbons. Add ribbons and lights to your windows and fence. Particularly if you live in a warm climate, sitting outside during the Christmas holiday will bring a smile to your face and your neighbors. Merry Christmas, indeed! 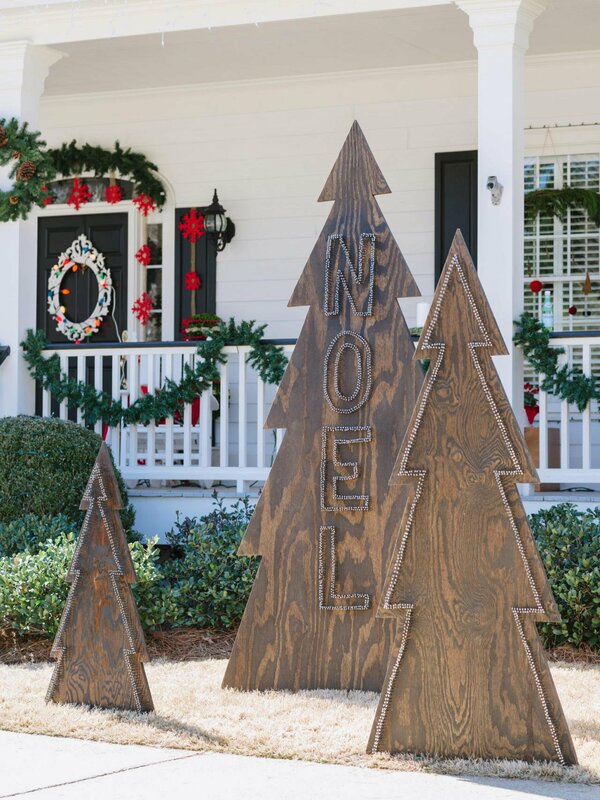 This DIY Christmas decoration project allows you to use your wood shop skills or at least look for someone to help you. Take old plywood and cutout a trio of Christmas trees. For the tall tree use a larger piece of wood. Attach the trees to a sturdy post and nail it into the ground. Next, embellish your tree with a holiday saying and decorations. In this idea, the trees are embellished with electric lights and the center tree contains says NOEL. This will bring a smile to your neighbors and spread the holiday cheer. 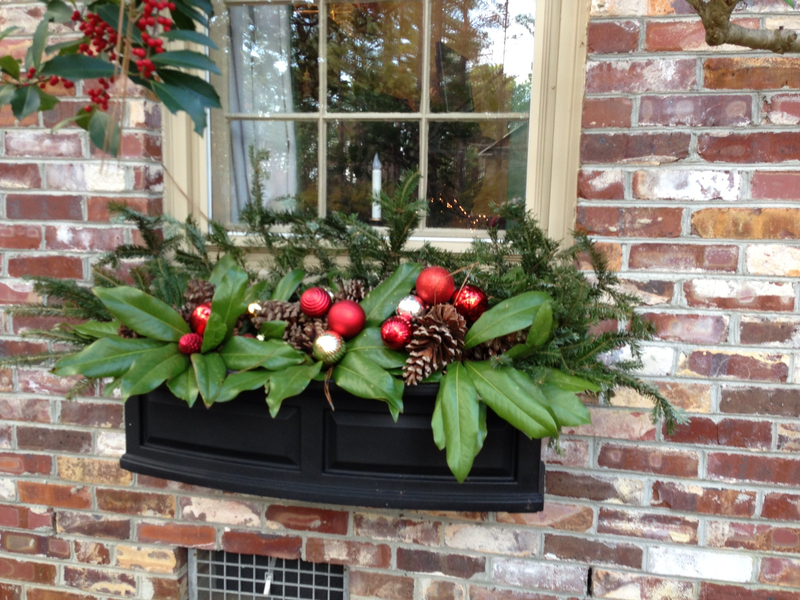 Winter arrangements are a great way to use empty window box planters during the winter months. Add small to medium sized plants inside the window box planters, taking care to keep the pot portion of it out of sight. Next decorate the arrangement, with larger green leaves and embellish with festive holiday ornaments. You can add ribbons, plastic plant or flower fillers, and cloth flowers to fill up your window box planters. Some season vegetables like purple cabbage add visual interest to this decorating idea and is a nice way to incorporate holiday color schemes.